Relationships are difficult. Any kind of relationship needs time, dedication, and a hell of a lot of work. Throughout our time together, my hair and I have encountered a lot of mishaps, confrontations, and disagreements that sometimes have made us fall out of love with each other. We’ve been together a long time now, and I can say with all confidence that we’re at the pinnacle of our relationship: we know exactly what make us happy, and which triggers to avoid. I must confess that we have tried everything to keep us happy together. We tried every trick, every tip, and every trend to keep it interesting. My hair has been patient with me and I with it, but we’re not that young anymore, so there are some things we know we can’t pull off even if we’d like to. But that doesn’t stop us from searching those things that make us happy and bring a je ne sais quoi to the relationship, things that, to the uneducated eye, could seem like small details, like a great shampoo, an awesome conditioner, and innovative high-tech styling tools. And this is the story that I really came here to tell you. 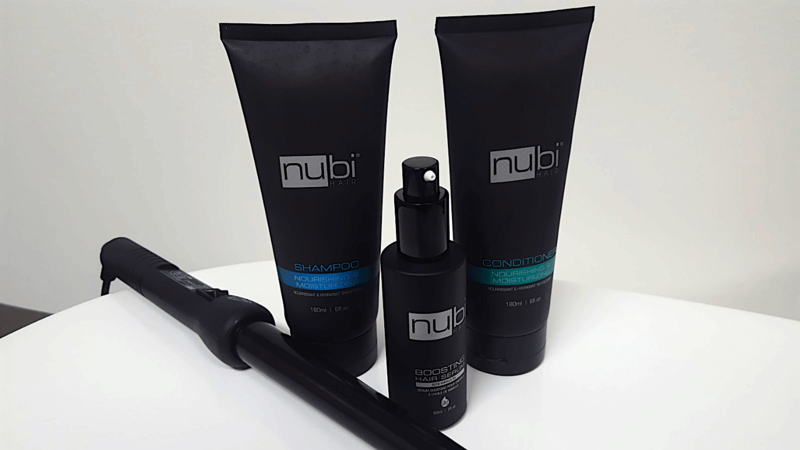 How Nubi’s line of hair care products and hot styling tools have breathed new life into our relationship. I possess strong, coal-black tresses with soft waves, but it hasn’t always been like that. In the ‘90s, being just a teenager, I convinced my mother to let me have a perm, which were in super in vogue during that time (Carrie Bradshaw anyone?) and, girl, how I loved those curls! My hair was young and strong and managed to resist the curlers, the ammonium, and other toxic chemicals all in the name of fashion and “beauty” (let’s face it, “beauty” is a very relative term, and even more so in the ‘90s). I took care of my curls as if they were my babies. I bathed them only with the very best chemically treated hair products, acquired the indispensable diffuser to make my waves come to life, and used the quintessential hair product of that decade: mousse. Needless to say, after those crazy times it took my hair years to recover its original luster and bounce. Several years after the perm, another crazy trend arrived: fantasy dyes. Of course, I couldn’t let this fashion pass me by. At that time, we only had about 4 colors, not all the variety we have today (mermaid, unicorn, oil slick, etc.). So, I turned into a blue headed girl. In this case, I don’t regret my decision, and I would turn blue again anytime. It took a lot of effort to keep that shiny, peacock blue, but it was worth it. Anyway, the reason I’m telling you all this is because I want you to know that even though my hair is not chemically treated at the moment, it has been through a lot, and that not any hair care product can do it good. My requisites are, in no particular order: texture, scent, ingredients, effectiveness, and, in the case of styling tools, that they make the job easy. Every great hairstyle starts in the shower, so making sure to use the right products for your hair is a must. 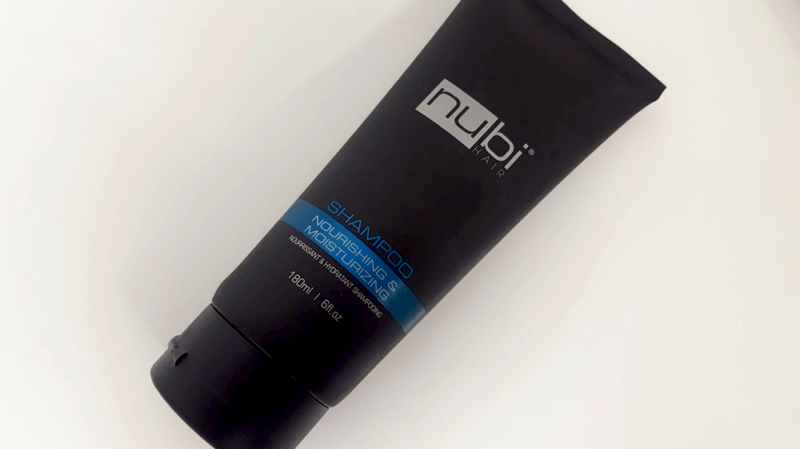 Nubi’s Nourishing & Moisturizing Shampoo is the perfect product to start your hairstyling routine, because it leaves your hair clean, soft, and manageable. Its thick and creamy consistency assures you right there and then that it will be a pleasant washing experience. And why is consistency important? Well, in my experience, the thinner the product, the less it will clean your hair and the quicker you’ll run out of it. 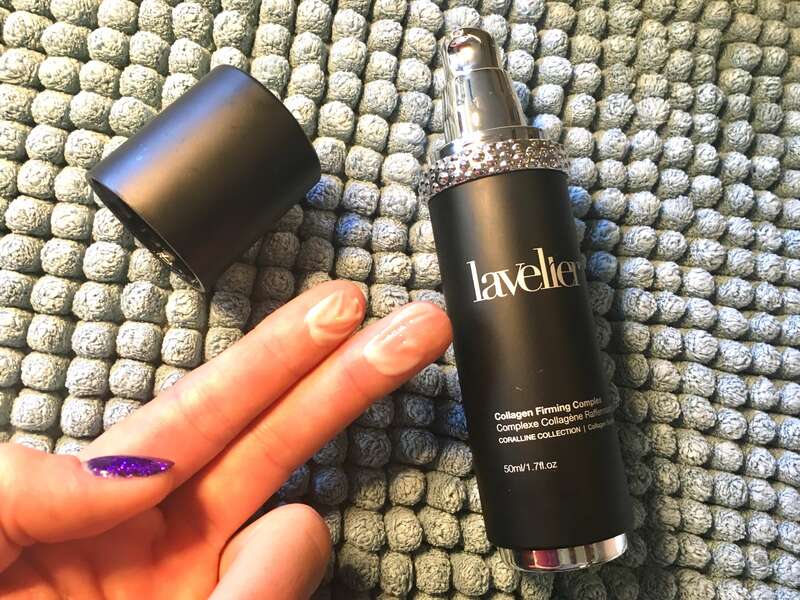 Products with higher viscosity tend to have more active ingredients, too. When I try a new shampoo, I’m always afraid that it won’t lather like a real shampoo. You’re totally excited with this new shampoo that everybody says is the best thing on the market, and then, nothing. No lather, not a little bit of that instant foam action that will wash away all the dirt and oil away, leaving your hair squeaky clean. But not Nubi’s Nourishing & Moisturizing Shampoo. This shampoo creates a good lather and cleans your hair very well, but it’s not just that: it’s enriched with proteins derived from plants, and it has olive oil. OLIVE oil! I don’t think I have to tell you again about all the good things olive oil can provide your hair, but I’m going to do it anyway, just so you can really understand the qualities of this shampoo. In ancient times, olive oil was referred to as “the great healer” and “liquid gold”, and it’s not undeserved. Olive oil provides many benefits to our wellbeing and health in general, and it can be your hair’s best ally. For example, it can prevent split ends by moisturizing your hair and helping it to grow stronger. It also softens it, making it easier to style. Another thing I really like about it is its fragrance. I have nothing against floral scents or fruity smells, but I prefer a clean and soft scent for my hair. 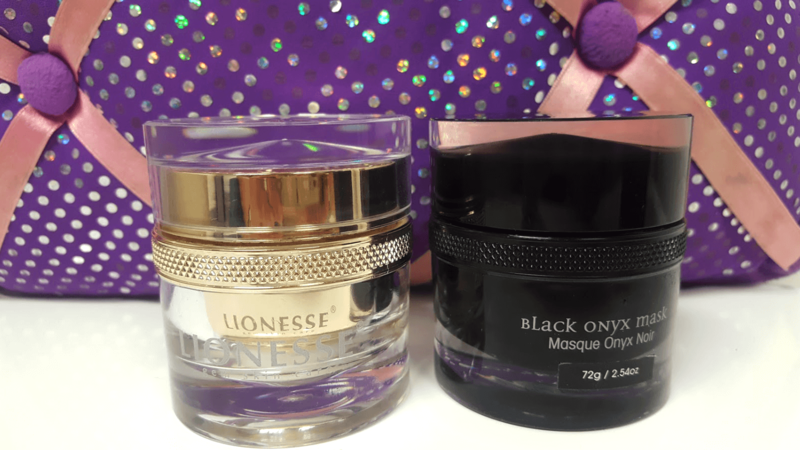 Sometimes I’ve found that hair care products with strong scents clash with some perfumes. But with this shampoo, your hair will smell very nice without being overwhelming. There are a lot of myths around the use of conditioner. Some say it will flatten your hair or make it fall out. Others don’t use conditioner because their shampoo has softeners and moisturizers that efficiently detangle their hair. In my case, I can say that I can’t live without conditioner. My hair tangles easily, and don’t get me started about frizz. I must confess that, yes, sometimes my hair falls out more when I use conditioner, but I’ve found that this mostly occurs when I apply conditioner directly to the roots. The best way to apply conditioner is massaging it from the middle of the length hair to the ends. Finding the right conditioner for your hair depends on a lot of aspects, like the hair’s length, texture, thickness, if it’s chemically treated, etc., so it’s very important that you find the right one for you. All in all, I wouldn’t recommend you skip conditioner if you want to keep your hair looking its best. 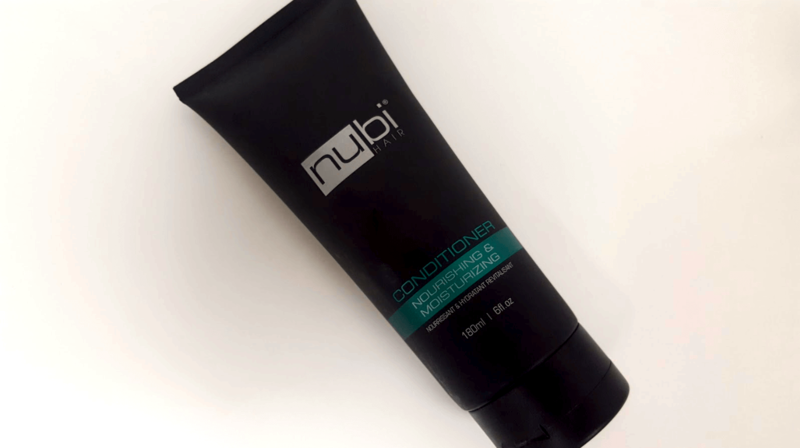 That being said, I have to tell you that Nubi’s Nourishing & Moisturizing Conditioner is a real treat in the shower! With the same color and viscosity of the shampoo, you can feel this conditioner working on your tangles right from the moment you use it. Leaving my hair knot-free while avoiding frizz from the shower saves me a lot of time and complaints. I think that just like with the shampoo, the olive oil makes a lot of difference. Even if you don’t usually include a conditioner in your hair care routine, I would recommend you incorporate this one, especially if like me, you use hot styling tools on a daily basis, because even though it’s not specifically designed for this use, using it often will help your hair keep its shiny, healthy look. I’m always mesmerized when I find a hair product that, besides leaving my hair feeling soft and looking amazing, also smells great. The scent of the Nourishing & Moisturizing Conditioner has a nice, soft, clean fragrance, just like the Nourishing & Moisturizing Shampoo. Not a bit like when you use mayonnaise to hydrate your locks, but paying the very high price of having to endure an absolutely terrible smell. 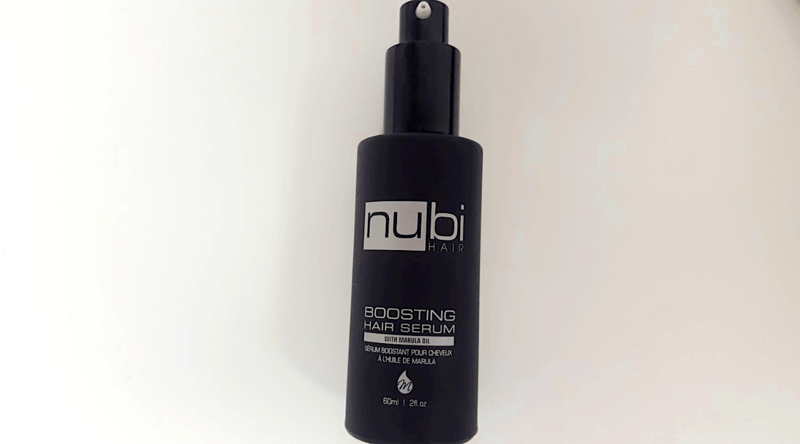 Now, if you want your hair to really acquire a silky, brilliant sheen, you have to use Nubi’s Boosting Hair Serum. Formulated with wondrous marula oil, this hair serum is ideal to use after using a straightener or a curling wand to avoid frizziness. We’ve talked about the amazing moisturizing properties of olive oil, and there’s no question about that. Marula oil is another wonderful oil that helps protect and beautify your hair. Known as Africa’s best kept beauty secret, marula oil is extracted from the seeds of the marula tree. It possesses a very fragrant scent and it is said that it has 60% more antioxidants than argan oil. So if you want to show off your really gorgeous hair, marula oil is always a safe bet. 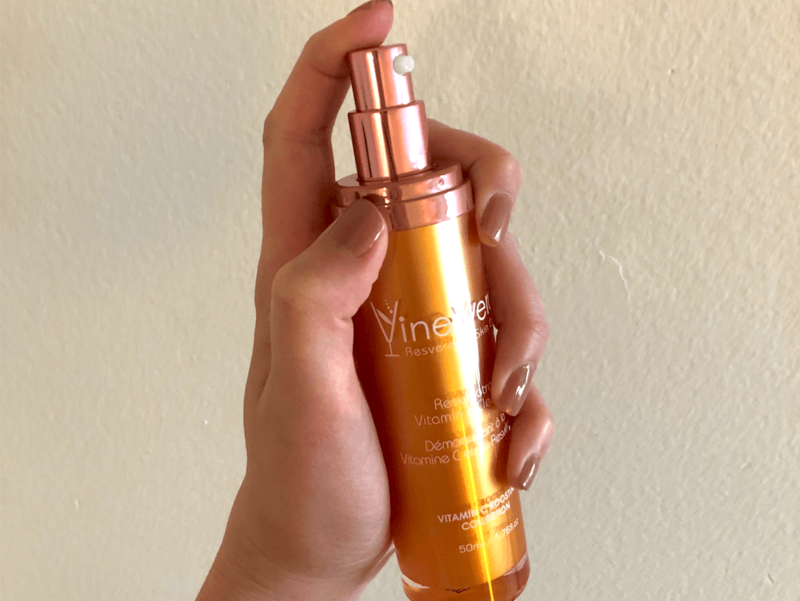 Aside from the marula oil, this serum contains aloe vera extract and vitamin E. The aloe vera will promote hair growth while giving it a beautiful, healthy look. It also conditions and protects it. It’s no wonder this magical plant has been a primary beauty ingredient since ancient times. Vitamin E has other incredible properties. Rumor has it that it can even turn damaged and unmanageable frizzy hair into beautiful, soft, and shiny locks. With all these incredible ingredients, you have all the best reasons to try this luscious hair serum. Did I tell you about that time when I permed my hair? Yes, I think I already have. Then you won’t be surprised about how much I like curls. True, I don’t get perms anymore , because they can really take a toll on your hair, and I tend to get bored with the same hairstyle if I keep it for too long. My hair is more on the straight-wavy side, so if I want it to look sleek and long, I use a straightener. But, even though straight hair is fine with me, what I really love are curls: beautiful, shiny, bouncy curls. I mean really big curls. Think Cher in the ‘80s or Pretty Woman in the ‘90s. That’s the kind of curly hair I like. And how do I achieve that iconic wavy hair in the 2018? Well, I have the ace up my sleeve, a secret weapon that works like magic in turning my hair into the voluptuous curls I’ve always desired: Nubi’s Grande Curler. Its Teflon 18/25mm tapered barrel is the perfect tool for my tresses. It heats up to 400 F, and its negative ion technology eliminates static and frizz, leaving me with just the beautiful and luscious locks I want. 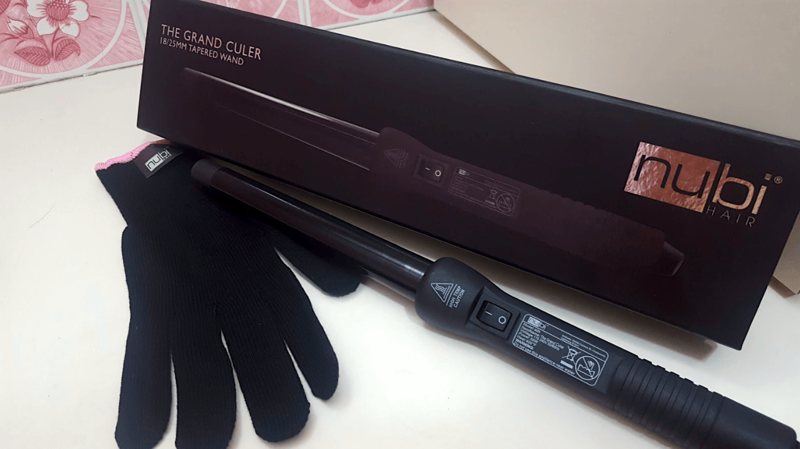 The Grande Curler itself is very easy to manage, because it has a long (because size matters) 360º swivel cord that makes it easier to reach every section of my hair without getting it tangled, and an easy-grip ergonomic handle. It also includes a glove that prevents your fingers from getting burned by the barrel, which I found very convenient because I tend to be a little clumsy handling hot styling tools. So, if you want a professional, voluptuously curly look from the comfort of your home, this is the curling wand for you. And that includes your hair. If you really pay attention, you can really “listen” to it. It talks to you by reacting badly to a new hair product, by lacking luster to complain about your daily routine, or simply by giving you a bad hair day after not taking the proper care of it. So, listen carefully, identify the signs, and respond kindly, and when you find the right products for you, stick to them and don’t let go. I can tell you in all honesty that using Nubi’s line of hair care products left my hair feeling smooth and soft, looking good, and smelling great. So, there. I just gave you the secret to my successful relationship with my hair. We’ve become more savvy about what makes us happy and we’ve learned a lot from experience. As I said from the beginning, it takes a lot of work, but in the end, don’t both of you want to look fabulous?